Imagine getting rid of your double chin and neck fat, without surgery or a lengthy recovery time. There are many devices on the market that promise to freeze or heat the fat under your chin without any incisions, however, most are limited in what they can accomplish and final results can take anywhere from 6 to 18 weeks to obtain. Dr. Thomas Barnes, Newport Beach cosmetic surgeon, has been featured performing his Lunchtime Neck Lift on the Today Show, The Doctors, Good Day LA and many other major media outlets. The video demonstrates the procedure. It takes approximately 20 minutes to complete, the patient is awake the entire time and is only under local anesthesia. Although it is not "non-invasive" since a small hole is made under the chin for the cannula and laser. The patient is able to have a conversation almost the entire time. Dr. Barnes first numbs the area with a local anesthetic (which takes 20 to 30 minutes to fully kick in) and then removes excess fat under the chin with a cannula. Following the fat removal, he treats the area with the SmartLipo laser to provide tightening and lift. After the anesthesia is working the rest of the procedure only takes about 20 minutes. Dr. Barnes can perform variations of this procedure on nearly any other area of the body. "Using SmartLipo laser liposuction, I can remove a little fat and actually help heat the tissue so it shrinks down," says Dr. Barnes, "In just a few days, patients return to their normal activities looking 10 years younger and without a double chin." 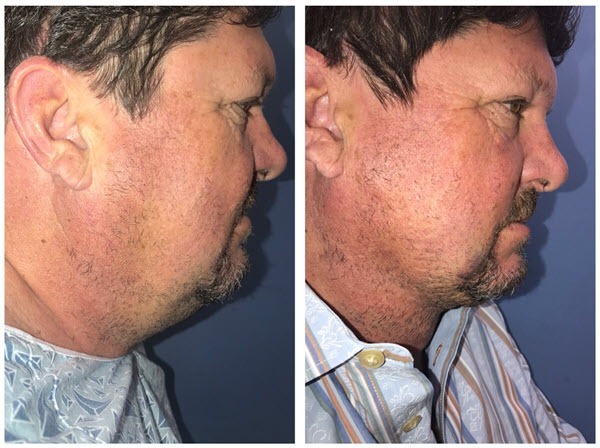 Dr. Barnes' patients can now look and feel younger with a short, minimally invasive procedure that requires only a few days of downtime compared to a traditional neck lift, which requires up to 6 weeks to fully recover. Although it is referred to as a lunchtime makeover, it is unrealistic to have this procedure performed and then return to work the same day. The editor of American Health & Beauty, shown in the photo above was back on his computer about 2 hours after the procedure was performed, but it would have been awkward in an office environment. It takes several days to a week or more for all the swelling & bruising to completely go away.